File this under "Chickens Coming Home to Roost". According to a Wall Street Journal article earlier this week,Rex Tillerson doesn't want a water tower built next to his horse farm because it could potentially bring lots of fracking trucks into his neighborhood. And that, he says, would be a profound nuisance. Tillerson, it turns out, is chairman and chief executive of Exxon Mobil Corp - the company that engages in ... fracking. The very same company that faces criminal charges over a 50,000-plus gallon fracking waste spill in Pennsylvania. And while he and his company support fracking elsewhere, he doesn't want the inconvenience - and unsightliness- of a water tower in his backyard. Tillerson and his Bartonville, TX neighbors have filed a lawsuit to block construction of the water tower because it's illegal and it's a nuisance. The 160-foot tower is located adjacent to Tillerson's property and will take away from his enjoyment of the view- an allegation countered by the water corporation that claims he already has power lines running across that view, so what's one more thing? Residents fear that the water company could provide excess water not needed by residents for use in hydro-fracking. "The construction of the water tower will create a constant and unbearable nuisance to those that live next to it," says the lawsuit (pdf, section 6.06). The suit declares that... "A water tower will have lights on at all hours of the night, traffic to and from the tower at unknown and unreasonable hours, noise from the mechanical and electrical equipment needed to maintain and operate the water tower..." Furthermore, the residents fear that the water company will "...sell water to oil and gas explorers for fracking shale formations leading to traffic with heavy trucks on FM 407, creating a noise nuisance and traffic hazards." And there's one other thing: the residents feel that the water utility has to obey local zoning ordinances and the rights of residents who relied on those ordinances and town laws when they purchased their property. Property which, by the way, runs into the multi-million dollar range. Which may explain why an oil company CEO is fighting the same battles as dairy farmers in the Marcellus: the town and people living in an area have a right to expect that corporations will follow their rules. Their Home Rule. In comments to his Town Council at their November meeting, Tillerson expressed concern that allowing the water tower to be constructed would open the door to runaway development. He said, "I cannot stay in a place where I do not know who to count on and who not to count on." 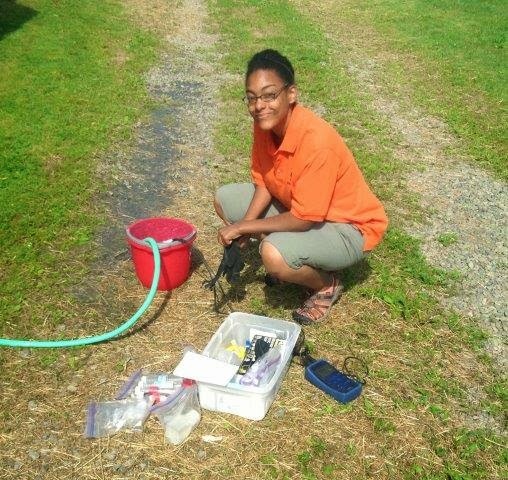 This summer, two graduate students from Syracuse University dropped by to collect water samples from my well. They were collecting data for Project SWIFT: Shale-Water Interaction Forensic Tools. My well was one of about 145 wells they tested between 2012 – 2013. The goal of the project is to develop a geochemical tool that can “unambiguously identify contamination of surface water and groundwater” due to activities related to energy production using hydraulic fracturing. Step one is to create a database of groundwater quality data before fracking begins. Some of the things they tested were methane, conductivity, metals (including barium and strontium), chloride, and volatile organic chemicals. Our water quality reflected the average in Tioga County in the Southern Tier of NY: very low amounts of most things – with methane being nearly undetectable. Because they want as broad a picture of groundwater quality as possible, the Syracuse researchers placed a grid over a map of the five counties they planned to sample. The grid broke the counties into squares measuring 7 kilometers by 7 kilometers. Then they randomly selected three wells in each grid as potential test sites and sent letters to the homeowners. They only considered wells that were at least a mile from any horizontally fracked gas well. The sampling teams collected water in a variety of plastic bottles and glass vials at each location. Methane samples needed to be analyzed quickly – so they were packed up at the end of the day and shipped overnight to the lab in Rochester. Other samples waited until the field team returned to Syracuse. Back at the lab, some samples were analyzed using ion chromatography to analyze dissolved ions. Other tests were analyzed in a mass spectrometer; that’s good for identifying halogens such as chlorine and bromine, and metals such as lead and iron. The team also used gas chromatography to identify volatile organic chemicals and semi-volatiles including propane, ethylene, ethane and propylene. Project SWIFT data is now available online in an “open-access, geospatially-referencedwater quality database”. Just click on a well and a pop-up shows water quality information. 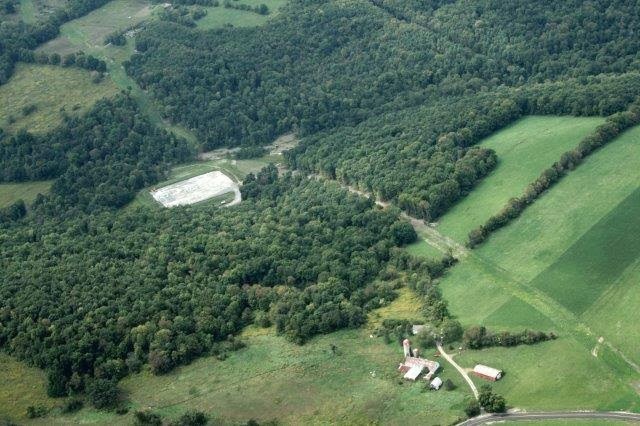 The Community Science Institute in Ithaca has been conducting pre-drilling groundwater baseline testing for landowners. In a couple months they’ll have their data online in a searchable database. More on that later, but you can check out their surface water databases here. You can read my longer article about Project Swift here. During January the PA Department of Environmental Protection (DEP) and the Environmental Quality Board (EQB) held seven public hearings on the proposed new regulations regarding surface activities related to oil and gas well development. Apparently that’s not enough. “One of the clear messages we’ve been getting through this hearing and comment process, from both industry and environmental groups, is that we should hold additional hearings and extend the comment period,” DEP Secretary Chris Abruzzo told the press. So now DEP and EQB are holding two additional public hearings – one in Troy on Monday, Feb 10 and one in Warren on Wednesday, the 12th. Just as important – they have extended the public comment period another 30 days to March 14. “Public participation is a key component when crafting these regulations, and we are happy to accommodate this extended period,” said Abruzzo. The proposed regulations, approved by the Environmental Quality Board back at the end of August, would streamline the process for “considering potential impacts to public resources during the well permitting process”. Requiring operators of gas and oil wells to identify any orphaned or abandoned wells within 1,000 feet of vertical and horizontal well bores prior to hydro-fracking – and require “visual monitoring” of the wells that may be affected by drilling. However, the new regs don’t require the operators to plug abandoned wells prior to drilling – only afterwards, if their fracking alters the abandoned well. Containment practices, using open pits for only temporary storage of materials and requiring tanks for longer term storage. Requiring operators to restore a well site within “nine months of completion of drilling”. Proposed regulations are posted on the DEP website here. Among them: concern about spreading brine on roads, inadequate standards for restoration of drilling and impoundment sites, and extending DEP’s duty to investigate water pollution to include all oil and gas activities – not just those that occur near the wells. You can read the comments made by citizens – and industry representatives – attending public hearings by clicking on links at the bottom of the DEP’s web page. Submit written comments. Mail written comments and summaries to Environmental Quality Board, P.O. Box 8477, Harrisburg, PA 17105-8477. 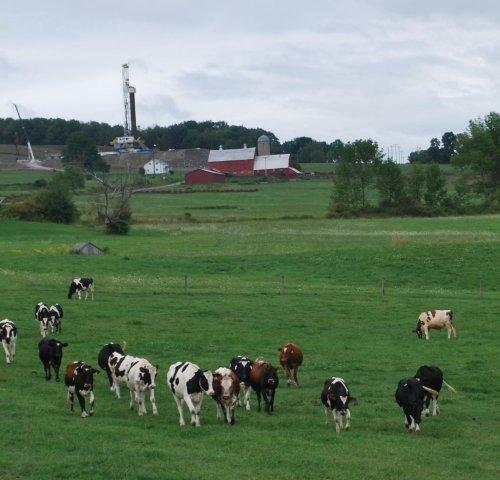 Yesterday, the Joint Landowners Coalition of NY threatened to sue the state if DEC doesn't hurry up and release the SGEIS to allow drilling - and fracking - in New York. This was in response to DEC chief Joseph Martens' comment a couple days earlier that the state had no plans to issue permits for fracking. DEC is waiting for Dr. Shah to complete the health impact review. 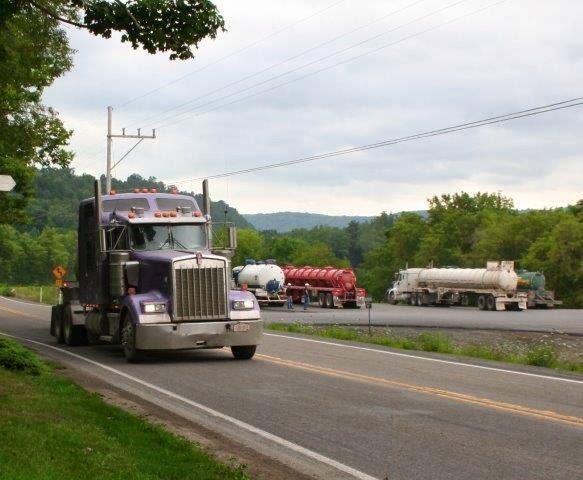 While the delay irks some landowners, many others appreciate the extra time, as new findings continue to come in regarding water, air and health impacts related to gas drilling. On the same day the landowners emailed and Fed-Exxed their demands to permit fracking, Colorado researchers released their findings that show that babies born near gas wells have increased rates for certain birth defects. The new study shows that women living near gas wells in rural Colorado are more likely to have babies with neural tube and congenital heart defects. These findings add to the already growing concern about health impacts from air pollution at drilling sites, compressor stations and other infrastructure. Lisa McKenzie and her research team from the Colorado School of Public Health analyzed birth defects among nearly 125,000 births in rural Colorado. They chose towns with fewer than 50,000 residents and examined records from 1996 - 2009, paying particular attention to how close the mothers lived to gas wells. What they found: babies born to mothers who lived in areas with the highest density of wells (more than 125 wells/ mile) were more than twice as likely to have neural tube defects as babies born to mothers living at least 10 miles away from gas wells. Babies in the high-well density zone also had a 38 percent greater risk of congenital heart defects as children born in areas with no wells. "Taken together, our results and current trend in natural gas development underscore the importance of conducting more comprehensive and rigorous research on the potential health effects of natural gas development," McKenzie et al wrote in their article published in the journal, Environmental Health Perspectives. The researchers admit that their study was limited in that they didn't have access to the mothers' health information, socioeconomic information, or actual exposures to air pollutants. They also knew only if a gas well existed in the year of the births - not how active it was - and they assumed that the address of the mother at time of birth was the same as during her first trimester. Given that the Colorado Oil and Gas Conservation Commission estimates that 26 percent of wells in Colorado are located within 150 to 1,000 feet of homes, these findings offer yet one more reason for DEC to overhaul - or withdraw - their proposed fracking regulations.